Accredited in the industry as one of the outstanding business firms, we are readily indulged in providing top class Hand Painted Musician Set. 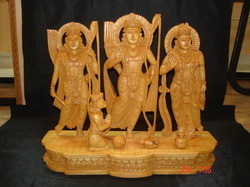 We offer our clients a complete wooden ram darbar carved out of high quality white wood. This ram darbar statue depicts lord rama, along with his wife goddess, sita and brother, laxman. Our craftsmen and artisans have carved out the entire sculpture with immense precision and dexterity. Wooden lady figure with nice carved & painted. After gaining vast experience in this field we proudly offer this Wooden Animal Figures to our valued clients. We make the animal figures of elephant, camel, deer, horse and many more. These are used widely by the children as toys and can be used as a decorative thing at home. As these are made with wood they are more secure. Wooden Crystal Shapes, Size/dimension: 3-4"
Handcrafted in different kinds of wood, our wooden figures have unique designs and patterns. Carved with high precision and skill, these sculptures of deities and animals are exquisite and exclusive. 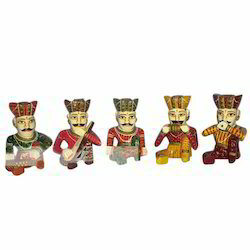 Made with premium quality wood, these figures are the synonym of Indian culture. Antique tribal folk art figure of a king.The main body of the figure is carved out of single log of wood. These types of figures are used by tribals in deep forest as part of their rituals. Royal elephant are interesting subject in wooden animal figures. Royal elephant used by indian rajas and maharajas and now once again people like this figure worldwide for his beautiful carving and royal charm. Set of 16 three dimensional geometrical figures of different shapes made of wood in a wooden box.